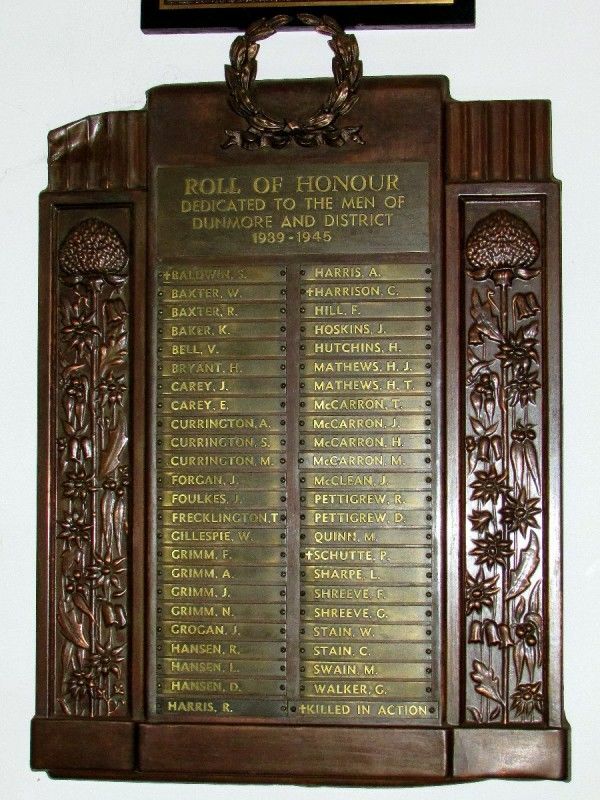 Dunmore's fine wartime record was referred to by Mr. John Howse, MHR when he unveiled the honour roll at the Dunmore Hall last week. He said that of the one hundred adults at Dunmore, fifty had enlisted in the Army, the Navy and the Air Force. "I have heard of no greater effort for one centre," he said. "I think it is a record." He was welcomed by Mr. McCarron, the hall secretary, Mr. Bryant, the president, and Mr. Mackay, president of the Peak Hill RSL. Mr. Howse, who had flown from Canberra to Sydney and then to Parkes before travelling by car to the function, quoted Lincoln's Gettysburg address before unveiling the honour roll. Narromine News and Trangie Advocate (NSW), 16 May 1947.